Traditional driveway materials like gravel, asphalt, and poured concrete have largely been replaced by the sophistication, versatility, and durability of concrete pavers. Paved driveways boost curb appeal by bringing an element of elegance to any home. Concrete pavers also bear few maintenance requirements and can be installed to create permeable and eco-friendly driveways. These are just a few of the benefits that should persuade you to pave your new driveway or renovate your old one in Milton, MA. When it comes to strength, poured concrete slabs pale in comparison to concrete pavers. These hardy units have also proven to withstand UV damage and freeze-thaw cycles. The elements are no match for these pavers, and neither are your vehicles. Concrete pavers are the best candidates to withstand frequent vehicular traffic, due to their incredible compressive strength and the ways in which interlocking pavers support one another. This is why paved driveways are popular for their low maintenance requirements. Besides the occasional replacement of a settled paver and the removal of a few weeds, a paved driveway requires little human intervention. As mentioned before, concrete pavers create stronger surfaces when interlocked. Each individual paver is fixed in place by all the surrounding pavers and, therefore, it will not sink or shift when driven on. Interlocking pavers are not just immovable, but are also crack-resistant. The joints between pavers enable them to move with the natural expansion of the earth, and yield beneath the weight of a vehicle. This flexibility prevents individual pavers from cracking. An elaborate paver pattern has the potential to transform your ordinary driveway into the focal point of your entire landscape! There are linear and interlocking paver patterns, each with their own visual effects. Linear patterns, such as the running bond design, can make driveways appear longer or wider, for example. Interlocking patterns, such as the herringbone formation, make the surface appear more intricate and captivating. Using more than two sizes of pavers can make your design look random and unpredictable, while a single paver size will create a neat and uniform surface. Laying rows of pavers in concentric circles is a great way to create a focal point that adds life and interest to a large, flat driveway. There are bound to be small spaces between the pavers that should be filled with jointing sand. The color of your jointing sand can be customized to suit the color palette of your landscape and, although it may seem like an insignificant detail, it can make a large impact on the overall look of the driveway. The sand can echo a color that dominates your home, creating a visual link between the driveway and the home. Alternatively, it could blend into the surrounding pavers for a more cohesive surface. It is unbelievable how much small details can influence a design! Circular patterns are compatible with many other paver patterns, including the herringbone and running bond designs. Combining two paver patterns will contribute towards making your driveway design even more exciting. This entry was posted in Design & Construction and tagged Color, Concrete Pavers, Curb Appeal, Driveways, Landscape Construction, Landscape Design, Landscape Maintenance, Paver Patterns on February 3, 2018 by 12850420. The floor of your Hingham, MA, patio has a massive impact on your patio’s style, atmosphere and how spacious it appears. The size, shade, and texture of your patio pavers, as well as the patterns in which they are laid, are elements that culminate towards a single aesthetic theme that may lean toward rustic, or modern. The patio floor can blend into the surrounding hardscape, anchoring more eye-catching features like fire pits, or it can utilize complex laying patterns and interesting color combinations to form its own focal point. Here are a few ways in which you can revive your old patio by customizing the pavers underfoot. Accent pavers are typically a different size and color to the field pavers that cover most of your patio floor. They are used to create the borders between different outdoor rooms, organizing the space into clearly defined segments with different functions and atmospheres. This ensures that the cozy ambience of your fireside doesn’t overlap with the bright and bustling atmosphere in your outdoor kitchen. The thickness and color of your borders can be customized to suit the rest of your hardscape. Opting for a color that complements the field stone, and continuing this color throughout all your accent pavers, will make the entire paved surface look unified and professionally put together. Having contrasting accent pavers can also add character to your patio and have a powerful impact on its design. Large, geometric shapes and clean, continuous lines are staple features of any contemporary hardscape. Consider large format pavers for an understated patio floor that not only screams modernity, but also helps other vertical features stand out more. 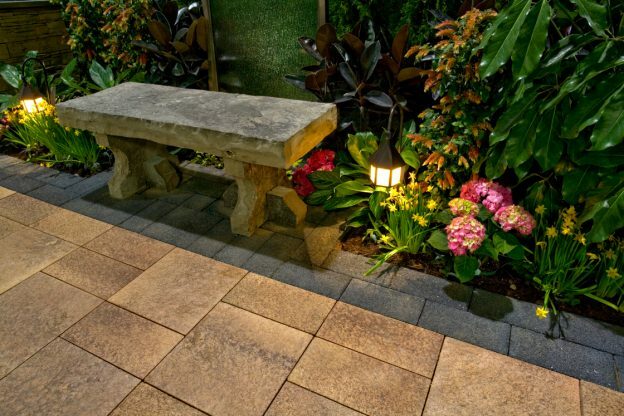 By acquiring pavers in light, muted shades like sand and gray, you can stick to your contemporary color scheme and ensure that your large pavers don’t draw more attention than intended. If you would prefer that your large pavers make a more noticeable impact on your patio design, go for textured varieties with slight variations in color. Pavers that emulate natural stone are good candidates for a sophisticated patio floor that is absolutely captivating. One advantage of utilizing large pavers is that they generally make a room seem larger and airier, as there are fewer jointing lines crowding the patio floor. Selecting large pavers in dark, rich colors, like burgundy, is not recommended as they have an imposing visual effect that actually makes the room feel smaller. The use of large pavers is by no means limited to modern designs. Large pavers that mimic natural stone can also be incorporated into rustic patios filled with unrefined materials and surrounded by plant life. 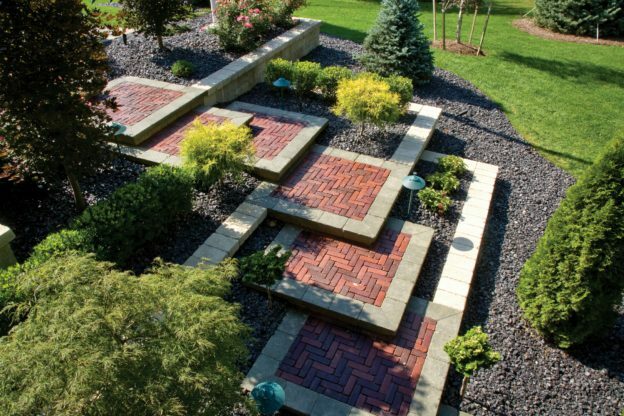 Laying pavers in intricate interlocking patterns can add depth and interest to your patio floor. This is especially useful when creating a large expanse of identical pavers, as this prevents a monotonous or overly predictable surface. When complex patterns like herringbone or basket weave patterns are created using pavers of slightly different shades, the result is captivating. You can draw further attention to vertical focal points, like fire pits or sculptures, by placing them at the center of a circular paver pattern. This entry was posted in Design & Construction and tagged Color, Concrete Pavers, Landscape Design, Landscape Design Themes, Patio, Paver Patterns on January 25, 2018 by 12850420. After a long day at the office, a tranquil backyard filled with lush greenery and a comfortable hardscape may serve as the ideal getaway. To achieve this, it is important that even the most rustic landscapes are organized. This can be accomplished by creating clear paths through the property. Walkways suggest a clear route through the landscape and enable its best features to be appreciated in controlled succession. With the following tips, you can transform your Walpole, MA, walkways into far more than just connections between focal points, and grant them their own pleasant atmosphere that will leave guests lingering. By filling your landscape with natural colors, sounds and scents, you can enhance its relaxing atmosphere. Frame your walkways with trees and shrubs that will attract birds and insects, as their movement and song will enliven the landscape and give the walkway a faraway feel. Nestling a bench beside the walkway, beneath the trees, provides the perfect opportunity to relax and enjoy their shade. Natural elements also tend to make homeowners feel more connected, giving them a chance to clear their minds and focus on that which is most important to them. Rather than tearing down vegetation to make space for your walkways, allow the paths to wind unexpectedly as they yield to the plants and rocks that already adorn the landscape. This can create the impression that your walkways formed naturally over time, especially when tumbled pavers or natural stone are used for their construction. A whimsical walkway through a natural landscape requires warm, textured materials that complement its surroundings. Natural stone, or concrete pavers in earthy shades, are excellent candidates for these walkways. Their textures will bring interest and character to the design, while their warm neutral shades will blend into the surrounding stone and soil that cover the rest of the landscape. A water feature, constructed using large blocks of natural stone, can go a long way in enhancing the ambiance of your walkway. The sound of running water can be hypnotizing and improve relaxation, so place a bench nearby from which you will be able to soak in the tranquil atmosphere. Constructing the water feature to appear natural and time-worn can also complement the fairytale aesthetic of the walkway. One way to transform simple walkways into captivating destinations, is through the use of lighting techniques. There are various heights and angles at which light fixtures can be placed in order to achieve different visual effects. Moonlighting, for example, entails nestling a light high in a tree and angling it downward to mimic the look of natural moonlight. Certain bulbs emit a harsh and bright light, so your contractor will opt for bulbs that emit more natural light. Solar powered lights, for example, are not only soft, but also benefit the environment! Fairy lights are always excellent candidates for romantic walkways, and can be trailed along the branches of trees. This entry was posted in Design & Construction and tagged Concrete Pavers, Landscape Design, Natural Stone, Outdoor Lighting, Plantings, Rustic, Walkways, Water Features on January 17, 2018 by 12850420. Now is the perfect time to plan for the year to come and imagine the ways in which your Hingham, MA, backyard can evolve. 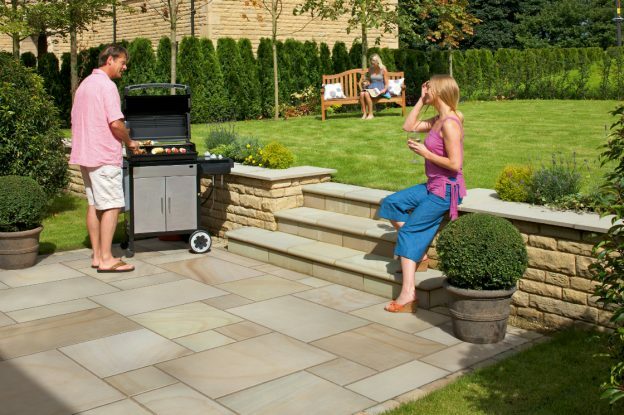 Do you feel like your landscape could be more attractive, or that your outdoor entertainment could be more practical? Read on to discover a few trends that could take your landscape to the next level in 2018. You can make your home feel like a beach-side getaway by creating a charming walkway at its entrance. Landscape designers achieve a distinct beachy look with the use of small white pebbles. These pebbles can be used to frame a walkway consisting of grass, sand, or tumbled pavers. Alternatively, the stones can be assembled to form the body of the pathway, flanked by small shrubs, flowers and larger rocks. When paired with a large untamed lawn and a Cape Cod style home, the relaxing and isolated atmosphere of a holiday beach-side house can be created. Shells can be scattered around large rocks or between plants to emphasize the theme. Is there a corner of your landscape that has remained unused for years, simply because its too small to turn into an outdoor room? Try making the most of your small, neglected spaces in 2018. One way to create an outdoor room free of crowded furniture, is by including multi-purpose retaining walls into the design. Retaining walls can outline the perimeter of the room, while serving as casual seating space or a surface upon which to place food and drinks. Refrain from incorporating plants and flowers in many different colors, as they can make the room feel crowded. Opt for a monochromatic color scheme instead, filled with pops of cool color like blue, silver, and teal. Turning small spaces into destinations doesn’t mean that they have to be able to accommodate many people. Consider creating a tranquil space where you can be alone and unwind or meditate. You could nestle a small water feature beside a snug bench and allow the surrounding plant life to envelop the rest of the space. Japanese landscapes are inspiring works of art that incorporate many different elements of nature, water features, and organic materials like wood. They refrain from using materials that look artificial, like concrete, for example. Consider creating a waterfall shrouded in plant life that empties into a large pond. 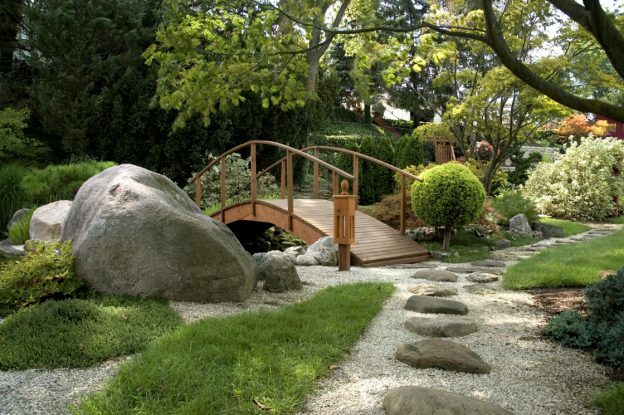 A sophisticated wooden bridge may be constructed, leading to a small patio underneath a pair of large flowering trees. Japanese influences work best when you have a large landscape to experiment with, and are centered around creating harmonious shapes, sounds, and textures. Outdoor dining areas are generally situated snugly against the home so that trips to the indoor kitchen can be made unnoticed. However, more homeowners are creating distance between their al fresco dining and home. You could create a decked out kitchen right beside your dining area – with all the appliances and utilities you would ever need. Or you could simply carry your plate a bit further, from your indoor kitchen or existing grill to your new secluded dining area. An isolated dining area can help to make the ambience of dining under the stars more immersive and unique. Having a fire pit or hot tub nearby will ensure that pre- and post-dinner entertainment is always available. This entry was posted in Design & Construction and tagged Color, Landscape Design, Outdoor Dining, Outdoor Furniture, Outdoor Rooms, Walkways, Water Features on December 31, 2017 by 12850420. Your front yard is the prelude to your home, giving guests a peek into the aesthetic and style that pervades the rest of your home and landscape. A contemporary home and hardscape therefore requires a front yard incorporating the latest trends. Minimalism still has a strong influence on modern landscape design and few homeowners still have a flowering garden and cobblestone pathway leading to their front door. Here are a few features that will ensure your Walpole, MA, front yard stays one step ahead of the others on your street. A patio is by no means restricted to your backyard. Creating a small patio at the front of your home can serve to welcome guests as they arrive. It can also be the perfect place from which to watch your kids play on the lawn or enjoy a cup of coffee. Make relaxation possible by adorning the patio with a small bistro table or an assortment of comfortable chairs. Although textured wood can give a structure a time-worn look, it also provides textural interest to an otherwise sleek patio. Incorporating plenty of geometry into the patio will further the modern aesthetic of your patio. Steps leading up to your patio can add vertical interest to your front yard, making it more visual interest than a simple two-dimensional layout. Desert-themed, or ‘dry’ gardens are a relatively recent trend that embraces the minimalism of modern landscape design. Instead of soil, these beds feature gravel and small stones. While plants are rooted in fertile soil, these dry materials are scattered on the surface to give the base of the plant bed a textured look. These look especially stunning when paired with minimalist homes that boast the cool, neutral shades found in stone and rock. Dry gardens tend to bear only a few statement plants, sparsely surrounded by smaller shrubs and groundcover. When incorporating all these minimalist design techniques, one risks allowing your hardscape to appear boring or empty. Fortunately, strategic landscape lighting can make the most understated hardscape designs look interesting. There are various techniques, involving the placement of light fixtures at different heights and angles, that achieve various visual effects. Some lighting techniques, like highlighting, draw attention to a feature within the landscape, such as a sculpture or interesting plant. Other techniques, like silhouetting, are more subtle but equally captivating. Landscape lighting will also ensure that your front yard can be navigated safely after sunset, and can even improve your security by making any would-be intruders easy to spot. Asian-inspired hardscapes are part of a surging trend. While sticking to minimalism, this trend incorporates more textured materials like wood and water. Outdoor designs incorporating these materials also tend to have a wonderfully tranquil appearance. Geometric planters filled with fine stones or sand can mimic small zen gardens and can be filled with a few small plants planted in a linear fashion. Smooth, refined wood is a dominant feature within modern asian-inspired hardscape designs and can be used to create a relaxing deck that leads to the front door. Consider creating a cool geometric pond just in front of your front entrance, with a wooden deck or concrete slab leading to the door. This can add a captivating element to your home and can serve to make it truly unique. This entry was posted in Design & Construction and tagged Curb Appeal, Front Entrance, Landscape Design, Modern, Outdoor Lighting, Patio, Plantings, Water Features on December 26, 2017 by 12850420. If you’re looking to expand your landscaping beyond a patio, there are many ways to incorporate new features. Working with your already existing patio surface is the best way to make new elements feel like part of the original design. 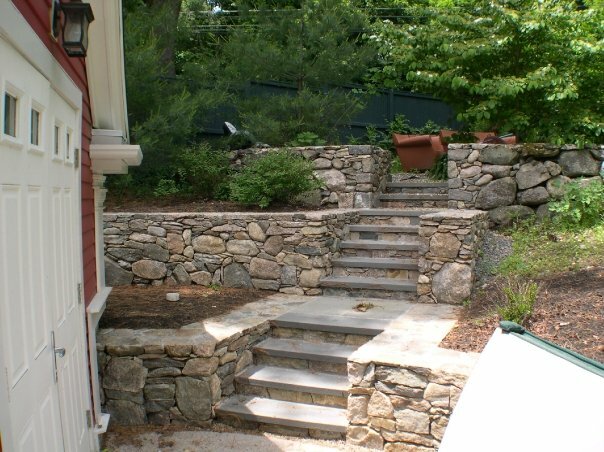 Add some of these features to match your stone patio in Walpole, MA. Walkways add form and structure to your landscape. They also help define the flow of traffic, while guiding visitors to focal points or outdoor rooms. For a cohesive look, opt for walkways that match your existing patio design. To match a classic brick patio, manufactured concrete pavers can offer the same look as natural clay bricks, and are even more durable. Limestone and flagstone make beautiful walkways that complement a natural landscape. To continue a country garden feel throughout your yard, add paths in a coordinating stone. If you prefer walkways that look a bit more formal, concrete pavers are available to match the look of bluestone. The transition from your backyard to your home should be seamless. Extending the same material from your patio to your doorway will create a staircase that blends with your landscape. Whether you have a casual landscape or a classic formal design, there are brick, flagstone, or limestone options to complement it. To get the look of high-end stone for less, concrete pavers offer an extremely wide variety of design options. There are many stone and brick patterns that look like real stone and will match your existing patio. Garden walls and retaining walls can completely change the look of your landscape. If you want to convert a steep grade into terraced sections, retaining walls that match your existing hardscaping will create a unified look. Low walls are an excellent way to help define an outdoor room and can also provide extra seating. Raised planting beds can also be designed to match your patio. Manufactured wall units are ideal for wall construction, and are available in a wide variety of sizes, colors, and styles. Manufactured units are also less expensive and easier to work with than natural stone. To soften the look of a stone wall, add curves by incorporating tapered units into the design. Outdoor kitchens are one of the most popular ways to transform your yard into an outdoor living space. The ability to cook and dine outside extends your living area and allows you to make more use of your backyard. To add an outdoor kitchen that blends with your current design, choose stones that match the appearance of your patio. To get the look of natural stone for a fraction of the price, stone veneers are available in a wide variety of finishes. Stone veneer is also durable and heat resistant so it’s a popular choice for outdoor kitchens. A fireplace adds warmth and creates a beautiful focal point for your patio. A large fireplace will also provide an extra wall to create shelter or privacy. Having your new fireplace finished with the same stone as your patio will make it seem like part of the original plan. If your patio doesn’t have room for a full fireplace, a fire pit can have a much smaller footprint. Either style will create a cozy and inviting ambiance and can be designed to coordinate with your patio. Related: Is It Too Late to Start on Your Stone Patio Project in Milton, MA? This entry was posted in Design & Construction and tagged Concrete Wall Blocks, Fire Pit, Landscape Design, Natural Stone, Outdoor Fireplace, Outdoor Kitchen, Patio, Walkways on December 19, 2017 by 12850420. The front yard of your home is what people see first, yet many homeowners focus their landscaping efforts solely on the backyard. When winter comes, the backyard is buried under a blanket of snow and is rarely seen. Your front yard is on display all year long, however, and shouldn’t be neglected. Employ these winter landscaping ideas to improve the look of your Duxbury, MA, front yard when the temperature drops. A good landscape plan will take all seasons into consideration. Winter conditions and the maintenance that goes along with them can be hard on a landscape. Snow plows, shovels, and salt are all very harmful to both plants and hardscaping. To minimize damage during snow removal, situate items such as light posts and fences well away from the edge of the driveway. Plants should be kept back at least a foot from walkways to allow for snow pile-up in the winter. Remember to also invest in professional snow and ice management. Icy winter weather can make navigating walkways a hazard. Your front yard landscaping should include easy-to-navigate walkways and accessible entryways. Save meandering paths for the backyard and have front walkways designed to mimic natural traffic patterns. When dealing with a winter climate, walkways should also take snow and ice accumulation into account. A bit of ice makes angled surfaces very difficult to navigate. Incorporate stairs to avoid sloping walkways when possible. Heated walkways and driveways are one of the most convenient ways to combat winter conditions in your front yard. Radiant heating systems installed under the driveway or walkway will keep surfaces warm enough to melt snow and prevent accumulation. Once the system is installed a variety of surface finishing options are available. Pavers offer a much nicer appearance than poured concrete or asphalt and will make future repairs easier. To break up a blanket of white, ask Towne Tree & Landscaping about hardy plants that will add year-round interest to your yard. Evergreen trees and hedges will offer texture and color to your landscape in all seasons. Include different varieties to take advantage of the varying shades of blues and greens available. Trees and shrubs that hold onto fruits and berries over the winter not only look great against a white backdrop, they also provide food for birds when sources are scarce. Crab-apple trees are beautiful in all seasons and often hold their fruit in colder weather. Winter blooming plants such as Winter Hazel and Holly will provide pops of color in your yard. Include tall perennial grasses to add texture and movement to your front yard. Incorporate them in planting beds that would otherwise be buried under the snow to add interest year-round. 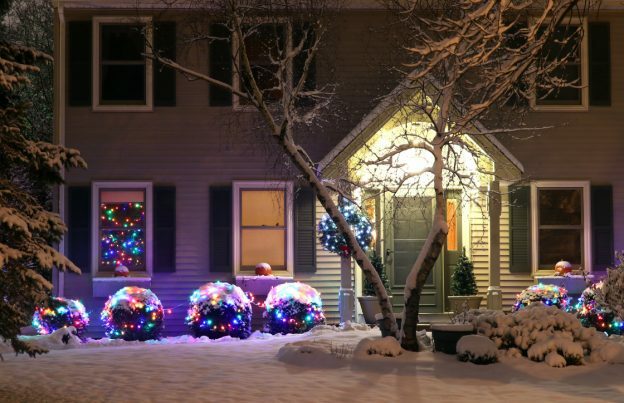 As the temperature drops and days get shorter, winter lighting becomes even more important. For safety, as well as aesthetics, the front yard should be well lit and inviting. If you arrive home after dark on a regular basis, consider having motion sensor lighting, or timers installed. Lights focused on the driveway and entryway will come on when you approach in the car or leave the house for maximum safety. To prep your landscape lighting for winter, have a timer system installed so you can adjust the schedule for shorter days. For an extra touch, installing string lights in shrubs or trees will create a beautiful winter ambiance. This entry was posted in Design & Construction, Snow Removal and tagged Landscape Design, Outdoor Lighting, Plantings, Snow Removal, Walkways, Winter on December 18, 2017 by 12850420. A lot goes into planning a successful hardscaping project. Towne Tree & Landscaping will make sure you’ve covered all your bases, especially since masonry is a fairly permanent landscaping feature. After you’ve decided on the size and location, you’ll need to choose between dry-stacked or wet-laid masonry. This choice will make a big difference in the appearance of your final product. Read on to learn more about which type of masonry is better for your Hanover, MA, stone wall. Dry-stacking is one of the oldest forms of stone masonry. Dry stone masonry involves laying stones on a secure footing of sand and gravel and does not use mortar to keep the stones together. A combination of skilled workmanship, gravity, and sand help keep the wall upright and intact. Each stone is carefully selected based on its shape and structural integrity. The stones are then skillfully stacked in such a manner that provides both stability and good drainage. Dry laid stone provides a more rustic feel than mortared stone, but the look of dry stone masonry will vary greatly depending on the craftsmanship and type of stone used. Boulder walls use large fieldstones laid in a single row for the base, with smaller stones to fill in the spaces. This type of wall works well for boundary fences and lower traffic areas. Modern dry-stacked walls generally use quarried or manufactured stones which provide a cleaner look. 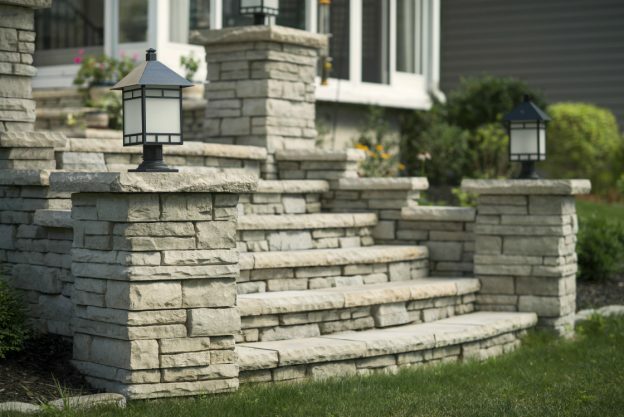 Dry-stacked stone can be used for retaining walls that are less than three feet high. With wet-laid masonry, stones are laid on a strong concrete base and mortar is applied between the stones to bind them together. Stone selection isn’t as crucial because the mortar fills in the gaps between stones. Wet-laid masonry walls offer more variety when it comes to the size and shape of your wall. Recessed mortar joints can be used to create the look of dry-stacked masonry while maintaining the durability of a mortared wall. Wet-laid masonry creates a cleaner, more formal look than dry-stacked. It provides excellent stability for your wall and is a better choice for high-traffic areas. Seat walls, walls, and counters for outdoor kitchens benefit from the structure and permanence of wet-laid masonry. 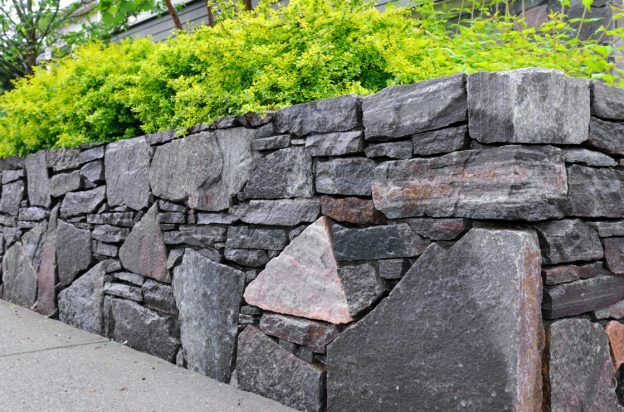 Mortared masonry is also the preferred choice for retaining walls because of its strength and durability. While both dry and wet masonry are durable and long-lasting, they do offer slightly different benefits. For climates with extreme temperatures and a high freeze-thaw ratio, dry stone offers more flexibility and is less susceptible to damage from frost heave. Minor ground shifts are generally absorbed by the wall as the rocks settle together. If damage does occur, dry stone is easier to repair, and rebuilt sections will blend well with old portions of the wall. Dry stone installations can also be quicker to complete than wet stone due to the lack of mortar. Wet-laid masonry offers more permanence but can be more costly than dry-stack, due to the additional materials and labor required. And eventually, the mortar will crack and require repairs. Wet-laid masonry also requires extra drainage to move water away from the wall since it doesn’t have the natural drainage properties of dry-stacked stone. This entry was posted in Design & Construction and tagged Dry-Stacked Masonry, Landscape Construction, Landscape Design, Masonry, Natural Stone, Retaining Walls, Wet-Laid Masonry on November 30, 2017 by 12850420. Traditional brick walkways are attractive landscaping features because of their historical aesthetic value and sense of age and elegance. Bricks offer a degree of strength and durability, but when it comes to refreshing the look of your Hingham, MA, walkway, you can also consider other alternatives that will provide a variety of color combinations and design options to complement your landscape. Concrete pavers offer the benefits of modern manufacturing methods and can resemble the appearance of original brick street pavers, as well as a number of other materials. They come in different shapes, sizes, colors, and styles, and are a practical option for many homeowners. Concrete pavers are easy to clean and maintain – if they get cracked or damaged, they can be easily removed and replaced individually. Concrete pavers allow contractors to easily create different shapes, curves, and decorative laying patterns for walkways that will form the signature piece of an your outdoor space. High quality concrete pavers are the ideal material for attractive landscapes. Not only are they affordable and durable, but also incredibly versatile. Concrete pavers offer modern options with sleek designs and straight lines that suit any contemporary home and cater to traditional aesthetics as well with pavers that resemble original, ‘old world’ brick and natural stone. Natural stone slabs are perfect for creating a modern looking walkway that impresses with its stunning, edgy design or rustic appeal. Popular types of natural stone used in walkways include bluestone, flagstone, granite, limestone, sandstone, and slate. Natural stone is a more expensive option for the construction of a walkway; however, its attractiveness is incomparable to any other material. Due to their natural formation processes, every natural stone slab or tile is uniquely colored, patterned, and textured. Natural stone can be used as a material in both traditional and modern landscapes. Large stones in cool colors, such as the blues and greens of bluestone, add a formal, dramatic appeal that can also visually enlarge the space. For traditional landscapes, walkways built from smaller flagstone or sandstone slabs will add warmth and texture. Flagstone is a popular choice as it can withstand extreme weather conditions and provides a naturally slip-resistant surface. A disadvantage of natural stone as a walkway material is that it is prone to staining, although this can be avoided with regular sealing. 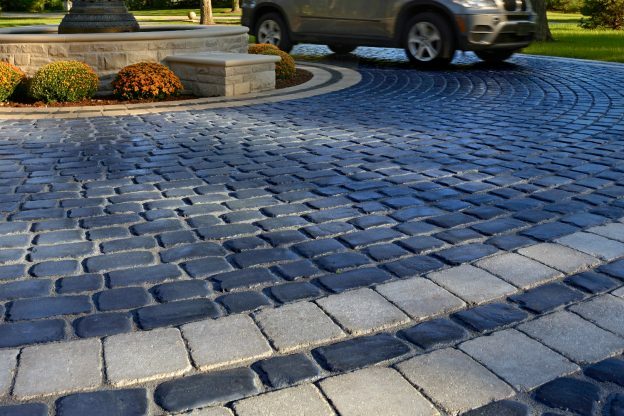 Permeable pavers are similar to regular concrete pavers but differ either in their composition or installation in a way that allows water to permeate the hardscape surface, either through the paver itself or in between its jointing lines. Permeable pavers offer the substantial advantage of creating a sustainable landscape by limiting stormwater runoff and providing relief for overtaxed stormwater systems. Permeable pavers are the perfect solution for homeowners that have problems with backyard flooding and can be used to disguise subsurface drainage systems or bypass regulatory limitations on non-permeable hardscape surfaces. Permeable pavers can be also be a good option for your walkway design to reduce the heating effect of hardscape surfaces. This entry was posted in Design & Construction and tagged Brick, Concrete Pavers, Landscape Construction, Landscape Design, Natural Stone, Permeable Pavers, Walkways on November 27, 2017 by 12850420. Is It Too Late to Start on Your Stone Patio Project in Milton, MA? Once the leaves fall and the temperatures drop, you might be inclined to set aside your landscaping endeavors, shelving them until spring. However, winter offers the opportunity to take care of a necessary element that improves your results in direct proportion to the amount of time spent – planning. Rather than pushing your stone patio project in Milton, MA, far from your mind, take the time to imagine, consult, consider, plan, and perfect the design plans so that they’re ready to roll when the weather again offers the opportunity. The layout that you choose shouldn’t be a rushed decision. Changing up the layout can indicate a change of function while also enhancing the depth of style. This choice has a much more powerful impact than you might imagine. To ensure maximum accessibility and flow for your patio allow the professionals at Towne Tree and Landscaping to offer their expertise when deciding on a layout suited to your outdoor space. While planning your stone patio project, choosing the right material for the construction is another vital choice. Important factors include the color of the home, the architectural style, and basic personal preference. Ensure that you look into significant elements like the maintenance required, slip-resistance, durability, and installation pressures. Making your choice based upon one factor like price or appearance alone is a mistake. This decision should be one made after thoughtful consideration of every relevant element and consultation with an experienced outdoor mason. Yet another critical stage of the planning process is determining the size of your project. This step depends on multiple factors including the size of the family, activities enjoyed, amount of furniture required, and the number and frequency of guests. The plan should also be to scale with the rest of the property. In other words, don’t overwhelm a small yard with too large a patio or fail to impress with a patio that seems miniscule in comparison to a large empty space. As you consult with professionals, keep in mind the importance of every item within the landscape, maintaining unity, balance, and symmetry. While most patios are rectangular in shape, you might consider alternatives for your particular property. Rounded, meandering, or multiple connected shapes are all inventive options for your patio space. Your plans should mirror your home, and with the time available during the cooler months, you can anticipate any potential issues and choose the most appropriate shape for your residence’s patio. The final item up for consideration during the design of your patio will be the accent and border decisions that you make. With a contrasting but complementary shade and texture, you can easily identify separate spaces. For instance, you can choose a look for walkways that is different to areas where you sit. Design a inlaid masonry rug to anchor furniture placement, or alternate the materials used between the outdoor kitchen space and the dining and relaxing areas. As you spend the winter planning for a spring start for your stone patio, allow a professional in the field to guide your decisions in order to ensure that every piece works with the rest and with your home. This entry was posted in Design & Construction and tagged Concrete Pavers, Landscape Construction, Landscape Design, Natural Stone, Patio, Professional Design Build Company on November 16, 2017 by 12850420.